The 200 block of Broadway in Downtown Fargo has recently seen a huge boom in development and new businesses. Joining the roster of new establishments is the lovely D’Vine — a quaint new bar offering its guests a vast selection of wine, beer, sake cocktails, cheeses and small plates. Located at 212 Broadway North, patrons enter D’Vine through a red door in the alley way behind the Loretta Building. This is a dining experience that is completely unlike any other establishment that we have in the Fargo-Moorhead area. Owners Michael and Heidi Rohr created D’Vine in hopes that it would give the area a taste of Zurich, Switzerland. It transfers perfectly with its warmth and ability to be the ideal environment for any diner, whether it is a romantic encounter, a business meeting, hanging out with your friends, or a place to set some time away for just you. There are no televisions and D’Vine asks that you refrain from talking on your cell phones (texting permitted), as it hopes to be a place where you can escape the distractions and chaos of the world and just sit back, relax and enjoy your experience there. When entering D’Vine, patrons will notice a lovely mixture of wood work and brick that is perfectly illuminated by a soft light coming from a gorgeous chandelier. The staff is attentive and friendly and this trifecta creates a wonderful and welcoming environment. D’Vine only seats 45 patrons at a time, which helps add to its quaint charm. The management has no interest in expanding; and since they are smaller it can focus on its excellence in service and quality product without missing details. 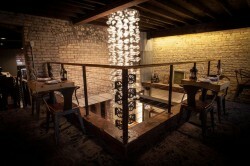 The wine list is vast and includes reds, whites, champagne and sparkling wines from all over the world. Beer is available either on tap or in a 12oz or 750ML bottle. There are flavors for every palate whether you choose wine or beer. D’Vine also offers more than 10 sake cocktails featuring Momokawa Sake from Oregon. HPR had the pleasure of trying a few of their signature sake cocktails including the Tokyo Mule (sake, ginger beer, a whole fresh lime and simple syrup), the Oki Martini (sake, fresh pineapple, lime and simple syrup) and the Kyoto Martini (sake, cucumber puree, simple syrup and lemon)—all of which were well crafted and delicious. With its menu changing weekly, D’Vine is certain to always have something interesting to eat. Unlike most restaurants that offer cheese plates, D’Vine offers a large selection of hard, semi, soft and blue cheeses that are each available in 2-ounce portions and served with bread. Rather than offer full cheeze plates, patrons can design their own custom cheese plate or just have one or two with their glass of wine and not be left with tons of leftovers or pay full price for a full tray. HPR tried three pieces of cheese during our visit; our favorites were the hard Cave Aged Gruyere and the blue Stilton, which we paired with a glass of port wine and candied walnuts upon the staff’s recommendation — delicious. General Manager Ty Singman said it’s a common dessert or meal-ender in England. Other small plate menu items include a cured meat plate, Bresaola Carpaccio (thinly sliced cured tenderloin with fresh lemon juice, olive oil, olives and Parmigiano raggiano), caprese salad, panzanella (garlic bread topped with diced roma tomatoes, garlic cloves, salt and basil) and Armenian hummus. Singman said he purchases fresh produce for D’Vine daily, so guests consume only the freshest and best ingredients. D’Vine also offers a biscotti, espresso, cappuccino and Lindt Truffles for dessert.